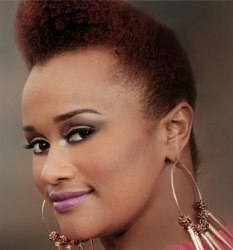 Call A to Z Entertainment, Inc. today for free information about how to hire or book gospel music singer Amber Bullock. We are your agent and talent agency for booking and hiring Christian and gospel music singer Amber Bullock! We book or help you hire any live professional entertainers you want, in addition to those you see on our site. We also help you plan and produce you show or event, so call us today at 888-655-4575 and we’ll be glad to help you. Amber Bullock, the St. Louis, Missouri native and single mother of her little girl Amya, topped a talented field of singers to win BET’s 2011 Sunday Best crown. Amber Bullock is the second artist to have a CD project released on Mathew Knowles’ Music World Gospel label, under the Sunday Best franchise. She is also co-managed by Music World Artist Management. The Season 4 winner released an EP, Thank You, on December 6, 2011 and the CD debuted at #1 on Billboard’s Top Gospel Albums chart! Amber Bullock captured the hearts of millions on the #1 rated weekly gospel music competition show, Sunday Best. Over 2 million viewers tuned in to watch the Sunday Best finale. Season 4 ranks as the #1 telecast in BET franchise history and the #1 cable competition show and Sunday’s #1 cable series among blacks in 2011. Amber Bullock’s Thank You features new studio recordings of jazz infused and neo-soul inspired interpretations of some of Bullock’s most memorable songs performed on Sunday Best. The EP is produced by Eric Dawkins for E Flat Entertainment. The first single, Walter Hawkins’ “Thank You Lord,” offers an upbeat soulful rendition of the Hawkins classic. Other songs on the EP include a jazzy solo turn on Kurt Carr’s “For Every Mountain,” where she shows off the runs that she became known for on the Sunday Best competition. We can help you book or hire any Gospel or Christian music singers. We’re your best talent agency and agent for hiring and booking gospel music singer Amber Bullock. So call 888-655-4575 today and we’ll be happy to help you. A to Z Entertainment, Inc. is not the exclusive agency for any live entertainers on this site.